The retinal photoreceptors of the squid and other cephalopods are composed of hexagonally packed cylinders of membrane (microvilli) that contain the visual pigment, rhodopsin, along with the other signal transduction proteins such as Gq and phospholipase C. The rhodopsin is expected to have an ordered arrangement in the microvillar membranes, because these animals can detect the plane of polarization of polarized light. 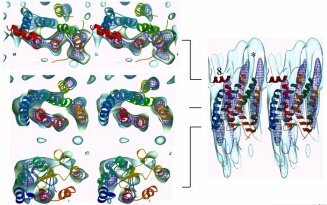 We studied the signal transduction pathway in this system using biochemical methods, and the rhodopsin structure by EM of 2D crystals. (a) Transverse and (b) longitudinal electron microscope sections of photoreceptor microvilli from the squid retina. (c) Substructure of the microvillar membranes. Image processing was used to show 2-fold and 3-fold structures linking the microvilli, suggesting that these invertebrate photoreceptors have a more ordered structure than bovine ROS membranes. This organization may provide the alignment of rhodopsin molecules needed for discrimination of polarized light by these animals. (d) Diagram of the membrane structures seen in (c). Schematic diagram of a slice of squid retina (centre) with expanded areas showing the structure of a retinula cell (left) and the arrangement of the photoreceptor membranes in the rhabdomes (right). The photoreceptor layer of the retina (centre, vertical stripes) faces the incoming light and the cut-away region shows the appearance of the receptor mosaic in transverse section. The ribbon-like outer segments of the photoreceptor cells weave together into a retinal mosaic with the microvilli running in two orthogonal directions (right). (Rh) rhabdome, (ON), optic nerve, (EC), extracellular space, (IC), intracellular space. This work was published in Saibil (1982) An ordered membrane cytoskeleton network in squid photoreceptor microvilli. J. Mol. Biol. 158, 435 456, and in Saibil & Hewat (1987) Ordered transmembrane and extracellular structures in squid photoreceptor microvilli. J. Cell Biol. 105, 19 28. Three-dimensional structure of an invertebrate rhodopsin and basis for ordered alignment in the photoreceptor membrane. Davies, A, Gowen, BE, Krebs, AM, Schertler, GFX & Saibil, HR, (2001) J. Mol. Biol. 314, 465-473. Projection structure of C-terminally truncated squid rhodopsin. One unit cell is outlined and symmetry elements are shown (space group p2221, a = 44 Å, b = 131 Å). Each unit cell contains 4 rhodopsin molecules. Contours below the mean value are shown as dotted lines. Sections and side views of two adjacent rhodopsin molecules in the lattice. The squid rhodopsin density map is shown as a transparent blue envelope with the atomic structure of bovine rhodopsin fitted in. There is good agreement between the structures. The fit suggests that the lattice contacts may be made between helix 8 (red) and helix 5 (orange). The linear arrangement in this lattice is consistent with the in vivo alignment of squid rhodopsins for polarized light discrimination.